At American Garage Door in Denver, Colorado, we have some great garage conversion ideas! Whether you’re looking to transform your garage into a lounge, an extra bedroom or an entire mini-apartment, these ideas will help you take advantage of the space and add value to your home. This is great if you want a nice area to lounge. A couple of couches or comfy chairs and a throw rug on the floor instantly convert the space. You can also drape soft material on the walls to help soften the effect and make the room look less like a garage and more like a den. If you want to keep the option of storing your car, you can leave the garage door as-is, and you can open it up for a refreshing breeze during the summer. 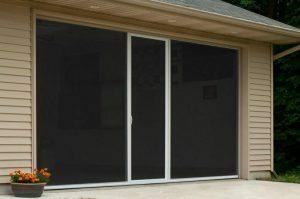 We offer garage door screens by Lifestyle Screens that are easy to use and perfect for keeping out the bugs while still enjoying the fresh air. This is perfect for when you want more space in your home, and your garage is attached. You can knock out the wall between your house and your garage and utilize the extra space however you like. Perhaps you can make your living room bigger, even close up the street-facing wall and add a custom garage door that opens to your yard instead. Or you could opt for a larger kitchen and entertaining area. One of the more popular garage conversion ideas is a playroom. Kids especially will love a space all to themselves where they can play with their toys. Parents will love having space where the kids can have fun without leaving their toys strewn about the living room and even just having a place to be on rainy days. Older kids will appreciate a game room with a video game system where they can chill with their friends. If you are amongst the growing ranks of professionals working from home, consider converting an unused garage into a useful home office. Set up a comfortable workspace and you might even have enough space to add a futon or a couch with a hide-a-bed that you can use as an extra bedroom for guests when necessary. Do you have an artist in the family? Garages are perfect for transforming into art studios. Between an open garage door and perhaps skylights, you’ll bring in a ton of natural light that artists need for their work and provide the space needed to work on projects at their leisure. Converting your garage into a guest suite works best if you have a double garage for the amount of space you’ll need, but it’s totally doable! You can remodel the space into a little apartment that you can use for out-of-town guests or even rent it out and make a little cash on the side. These are some of our favorite garage conversion ideas here at American Garage Door, but there are many possibilities. Just get a little creative, and you can find something to do with that unused space that is perfect for your needs!